3D printing may be the trendy thing right now, but traditional CNC milling isn’t going anywhere yet. Otherfab was a California-based startup that wanted to take the growing trend for a desktop 3D printer and apply it to CNC machines. The company’s 2013 Kickstarter campaign promoting its tiny Othermill device raised over $300,000, more than six times its original goal. And things seem to have gone well since then: As well commercially launching the desktop mill and rebranding to Other Machine CO., the company has released its Otherplan CAD/CAM software and announced a partnership with Autodesk’s Fusion 360. 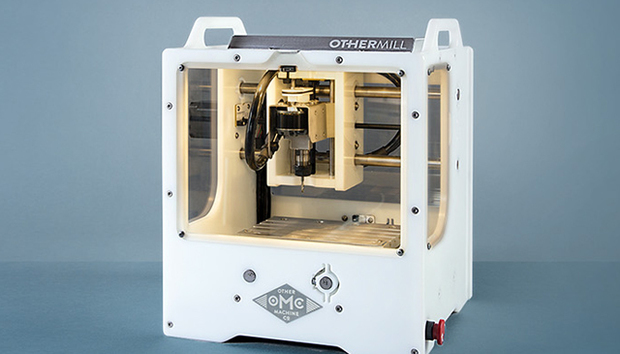 Although OtherMachine is unwilling to talk about how many mills it has sold, the company is happy to tell us it has raised almost $6 million to date, and wants to “double” the number of units deployed over the next 12 months. We spoke to OtherMachine CEO Danielle Applestone about crowdfunding, and how CNC milling and 3D printing complement each other. Your Kickstarter campaign was a success – what’s happened with the company and the product since then? We took outside investment and launched a commercial version of the product. We have now been selling and shipping commercial Othermills for over a year. We have grown from five people to nearly 20 folks and experienced what it is like to become a company, rather than a team of people with a campaign. How has the product changed since your campaign? It is now safer, quieter, and more precise in operation. The software supports multiple file types and we have focused heavily on making electronics prototyping extremely fast and simple. We also released a beta of the Windows version of our Otherplan software. We got them all out, but some deliveries were late by as much as 10 months. Overall, people were blown away by how good the experience was, given that they were essentially receiving the first 200 prototypes of a product made by a team of mostly novices. Many campaigns, despite initial success, run into trouble further down the line and often don’t fulfil their promises – how did you avoid this pitfall? Sheer elbow grease, huge amounts of stress, and more than our fair share of luck. Mistakes are a given, so we tried to minimise the cost of mistakes as much as possible. We also tried to do a lot of our prototyping and testing in house so that we could move quickly. Would you run another campaign in the future? It’s unlikely. But the difference is that a new campaign wouldn’t be run while trying to grow our existing business. Crowdfunding campaigns are more like a product launch, if you are already established and operational. You recently received $3 million in funding. What do you intend to do with the money, and what’s the long term business plan/goals? We have received nearly $6 million to date, and have invested it all in the growth of our company. Our next phase is building our sales and marketing function. Which audience are you targeting more: consumer, business, education, other? We have seen the most business from higher education. The Othermill is the safest and most affordable way to teach engineering and manufacturing in a hands-on way. Last year, we actively explored supporting that market. We also saw a ton of interest from businesses that do rapid prototyping of electronics and small mechanical components. They see it as a way to reduce the length of their product development cycle and get professional, functioning products made in-house. Both markets love the precision and the fact that you can use a huge variety of materials, like Aluminum and circuit board. When we last spoke to Othermill, the plan was to make your own software that was “simple, intuitive software that you don’t need training to use.” Do you think you’ve achieved that goal with Otherplan, and are there any plans to expand and monetise the software side of the business? We are getting there. By industry standards, the software is a dream to use, but by our standards, we know there is significantly more work to do. We don’t currently plan on monetising our software. A lot of the 3D printing companies we talk to agree that the software side of the industry is still lagging on ease-of-use compared the hardware, is that the case with milling? I agree. The issue is that the problem space is infinite. You have all the materials and tools and shape options available to you, so the user still has to come to the table with too much pre-existing knowledge of the specifics of the machine and nuances of the materials they want to use. The more we can do to guide the user and make the machines and software ‘smarter’, the easier it will be to get what you want from the machines in a short period of time. You told the WSJ that you predict mills will become as commonplace as sewing machines, but now that 3D printing can use materials such as wood, metal and food, is there a long term future in CNC machines? It will still be a long time until affordable ($3k) 3D printers can manufacture in metal/wood/food with the same finish quality and speed as CNC machines. There are trade-offs between both categories of machines, so desktop CNC won’t be a replacement for 3D printing, but rather these machines will be tools sitting side by side. It’s like a toolbox – you need a screwdriver and a hammer. You could definitely hammer a nail with a screwdriver (I’ve done it), but it’s not the right tool for the job. I believe that CNC machines will be designed for thousands of specific purposes over the next decade. What does CNC offer that 3D printing doesn’t? They are complementary. CNC is fast and precise, and you can do more materials with an entry-level machine. But 3D printers give you way more complexity when it comes to your design. You can print internal structures that you can’t cut with a CNC, unless you have a CNC that can cut on many axes, and even still, some parts are impossible to CNC. What are your thoughts on Voltera – another PCB manufacturing tool that found success with Kickstarter? Voltera is another in a suite of tools for PCB prototyping. It has some advantages over milling, but also some disadvantages when it comes to creating circuits that operate with the same electronic properties as a manufactured circuit. The more PCB prototyping tools out in the world, the better. Some will work for certain applications better than others, and I hope they do amazingly well. What are the plans for the company over the next 12 months? Double the number of Othermills deployed in the world!